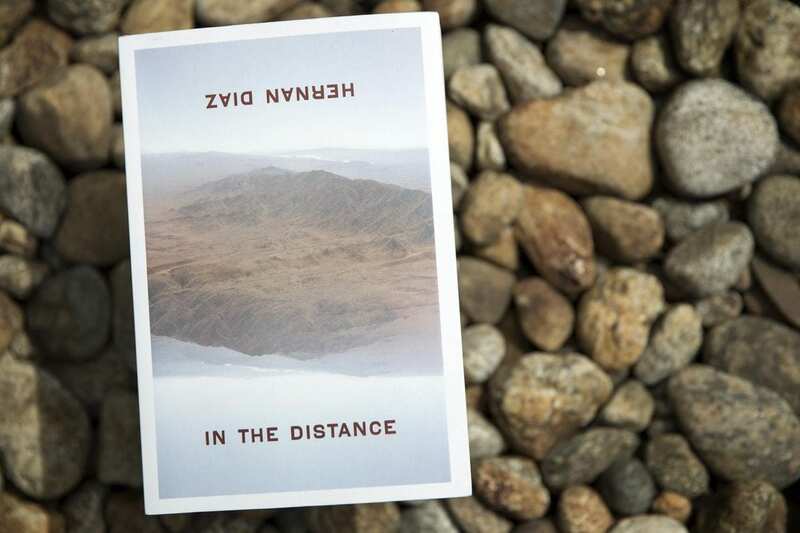 Hernan Diaz‘s debut novel “In the Distance” was a finalist for the Pulitzer Prize and the Pen/Faulkner Award for Fiction. The book tells the story of Håkan, an immigrant from Sweden who makes his way through the American West in the early to mid 1800s. Diaz joins Here & Now‘s Robin Young to talk about the book. He had not seen his own face since he had left Clangston. Only splintered reflections on blades, partial glimpses on lids, quivering images on water, or curved caricatures on glass—never a complete, truthful picture of his features. And now, there it was, lying on the desert. His face. Walking alongside the burro, he had crossed the shallow river and kept traveling north for several days without incident. Håkan was used to the illusions the desert conjured up from the dust. He had seen many pools spring up in the distance and then dispel as he advanced toward them, many hopeful or menacing shapes gather on the horizon that were nothing but the hazy ghosts of heat. But the blinding light coming from the ground was unlike anything else, and this strangeness conﬁrmed its reality. More than a glare, it looked like a frozen blast, a detonation suspended in its flashing climax. The sharp whiteness cut through his eyes. As he approached that silent constant explosion in the sand, Håkan realized that it was somewhat elevated, although it was hard to look at it straight on. A few moments later, he reached the blaze. It was the mirror on the open door of a massive wardrobe. The large trunk was beached on its back, disemboweled, and the open door hung from its hinges at an angle. He was impressed by the dresser’s craftsmanship—sensuous spirals and scrolls, lifelike paws and claws, plump cherubim and flowers. It was the softest surface he had touched during his long trip through the porous, pumice-like desert. Although there was something profoundly intimate about it—something conjugal—the dresser also called forth a crowded world and a sense of urban reﬁnement Håkan could only vaguely imagine. In fact, the dresser was the most concrete embodiment of those civilized comforts he had ever been free to touch and inspect. While running his ﬁngers over the turned black wood, Håkan’s approach to the mirror changed. The sun was no longer on the glass, and he was ﬁnally able to look into it. It took him a moment to accept the face he saw as his own. Some of his old features were gone, new ones had set in, and he had to ﬁnd himself in the image at his feet. The orange shadow of a mustache hovered over his lip, and the hesitant promise of a beard spotted his chin and hollow cheeks. At the sight of his emaciation and his protruding bones, he was reminded of his teeth. With great anxiety, he parted his chapped white lips to inspect his gums. The inside of his mouth, moist and red, was the only part of his body that remained unaffected by the arid wasteland. Relieved to ﬁnd his teeth as healthy as ever, he returned to that strange face that looked up at him in bewilderment. He had withered and wrinkled—the sun had burned deep crevices into his face. His eyes were permanently screwed up, but not as the result of a deliberate frown. This was just his face now, creased by the constant squint of someone facing an overwhelming light or an unsolvable problem. And his gaze, almost invisible in the narrow trench under his knit and ribbed brow, was no longer fearful or curious, but dispassionately hungry. For what, he could not tell. Before moving on, he was tempted to smash the mirror to take a shard with him, but the majesty of the dresser deterred him. As an afterthought, he also considered that its owners would surely come back for it at some point. He took one last look and walked away. With every day, as he kept moving north, bunchgrass became more abundant, and eventually the land turned yellow. Water was less infrequent, but Håkan still drank it with reverence. Gadflies and mosquitoes spurred him and the burro on—the assaults when they stood still and unprotected by a smoky ﬁre were so vicious that they once sent the burro bucking uncontrollably across the plains. Trees and thick bushes, however, grew scarce, and soon Håkan ran out of fuel. Charqui and raw wild mushrooms were his fare. Dogs, rodents, and birds became a habitual sight in that grassy extension that challenged the sky, and Håkan felt the joy of being once again a living thing among living things. A few days later, once the desert had yielded to the prairie, Håkan stumbled upon a rocking chair swaying back and forth in the open wilderness, nudged by the breeze. For a long time, as he approached it, he could not understand the meaning of chair, as if the object itself were a word on a page made up by those signs that would forever remain a cipher for him. He kept looking at the chair. What does chair mean? He reached it and touched it. He sat on it. The vast plains receded. He felt out of place, and there was something thrilling and comical about this. But at the same time, he also felt lonelier than ever—smaller, frailer. Although Håkan did not keep close track of time, he believed that, according to Lorimer’s directions, he should meet the trail fairly soon. And sure enough, three or four days after ﬁnding the rocking chair, Håkan ﬁnally ran into a path. He was confused. If emigrant trains were like traveling cities, this track seemed nothing more than a foot- path and just about one palm deep. It could never have been the result of oxen and wagons, and yet it was so regular in its construction and course, it could only be man-made. He followed the path north for a few leagues until suddenly, behind a thicket atop a small hill, he saw, for the ﬁrst time, buffalo. They followed each other down their trail one by one, in single ﬁle, with a slow step and great deliberation. Beyond this stately procession, as far as the eye could see, the heath was darkened with buffalo, grazing or wallowing in muddy basins. It seemed to Håkan that these beasts were made out of two different bodies ineptly put together. Their hind legs and quarters were positively equine—slender and toned—but with the last rib began a transformation, and, as if nature had changed its mind halfway through it, the animal swelled in a stupendous, monstrous fashion, suddenly becoming thicker and taller. Its back rose steeply and abruptly, leading to a head so massive (could that dense, anvil-solid block of bone that seemed impenetrable even to sound contain a brain or any flesh at all?) that, compared to the animal’s smaller back end, it seemed to have been dreamed onto the rest of the body. Below a pair of sharp horns, a pair of black eyes had been bored into either side of the skull. If any of the beasts that Håkan had seen in America had ever resembled his brother’s fabulous inventions, that creature was the buffalo. He pressed on. As the days went by, the sight of buffalo skulls, some of them bleached by the elements and scaly with lichen, became frequent. Håkan supposed that the pioneers must have hunted those beasts in great numbers, and the jettisoned goods he found over the following days—a trunk with china, bedsteads, a spinning wheel, cupboards, several cast-iron stoves, a large carpet he unrolled on the grass—seemed to conﬁrm the proximity of the trail. Sometimes it rained, and it was always a miracle. Excerpted from the book IN THE DISTANCE by Hernan Diaz. Copyright © 2017 by Hernan Diaz. Republished with permission of Coffee House Press.